P.A.D. is a disease in which plaque builds up in the arteries that carry blood to your limbs. The plaque buildup, or atherosclerosis, can harden and limit blood flow. The limited blood flow can cause many symptoms. 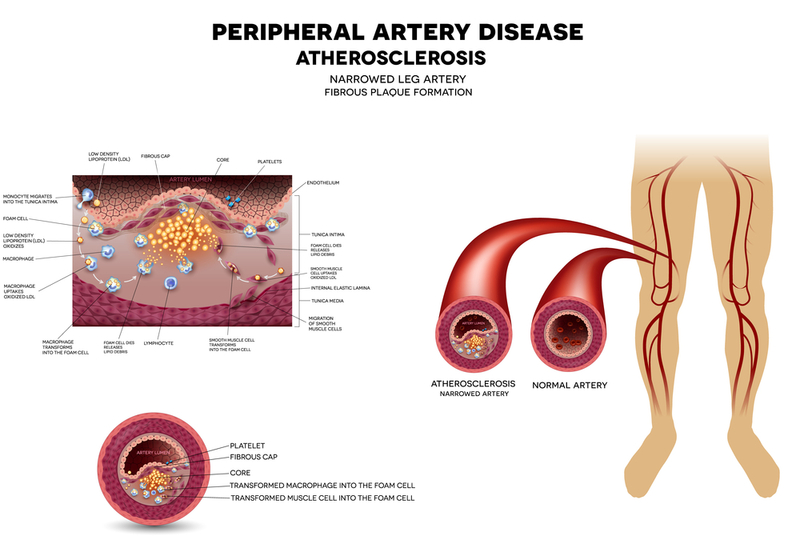 If the blockage remains in the peripheral arteries in the legs, it can cause pain, changes in skin color, sores or ulcers and difficulty walking. Total loss of circulation to the legs and feet can cause gangrene and loss of a limb. What are the symptoms of P.A.D? What are risk factors for P.A.D? If you smoke, you have an especially high risk for P.A.D. If you have diabetes, you have an especially high risk for P.A.D. People with high blood pressure, high cholesterol or are obese you are at risk for P.A.D. What are treatments for P.A.D? What tests can be done to check for P.A.D? a painless exam that compares the blood pressure in your feet to the blood pressure in your arms to determine how well your blood is flowing. This inexpensive test takes only a few minutes and can be performed by your healthcare professional as part of a routine exam. Normally, the ankle pressure is at least 90 percent of the arm pressure, but with severe narrowing it may be less than 50 percent. a non-invasive method that visualizes the artery with sound waves and measures the blood flow in an artery to indicate the presence of a blockage. a non-invasive test that can show the arteries in your abdomen, pelvis and legs. This test is particularly useful in patients with pacemakers or stents. a non-invasive test that gives information similar to that of a CT without using X-rays. (generally reserved for use in conjunction with vascular treatment procedures) During an angiogram, a contrast agent is injected into the artery and X-rays are taken to show blood flow, arteries the legs and to pinpoint any blockages that may be present.